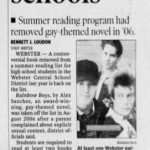 won the International Reading Association’s 2003 Young Adults’ Choice award, and the American Library Association selected it as a Best Book for Young Adults. 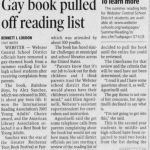 Sanchez was pleased to hear that his book is back on the list. 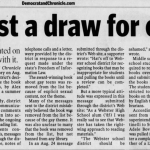 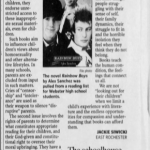 “I’ve been delighted to receive so many enthusiastic e-mails in support of my books from students and community members in the Rochester area — individuals who have actually read my books and recognize their value and worth,” he said via e-mail. 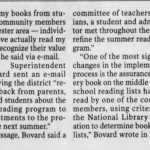 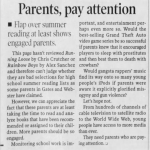 “One of the most significant changes in the implementation process is the assurance that every book on the middle and high school reading lists have been read by one of the committee members, using criteria from the National Library Association to determine books for the lists,” Bovard wrote in the message. 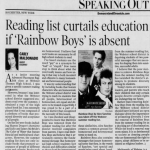 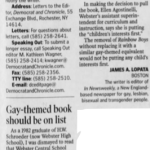 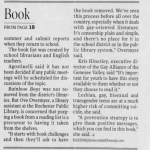 “The committee reviewed (Rainbow Boys) utilizing the criteria listed and made the recommendation for including the book as suggested reading for (high school) students,” she said in a separate message.